This year, tomato growers & lovers on the East Coast were faced with the nasty disease known as "late blight," which rendered many tomato crops useless within a matter of days. (You can read more about late blight in this op-ed from the amazing Dan Barber). If you're like me, lamenting the lacklusterness of this year's tomatoes, there's now a way to express your frustration. 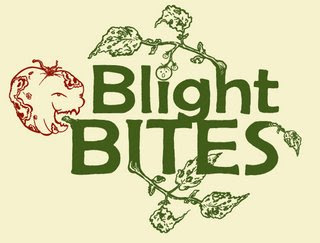 Introducing Blightee, Hudson Valley Seed Library's answer to the terrible blight. It's a t-shirt, it's an act of aggression, it's a way to say, "hey blight, you bite!" Get yours now, while supplies last. Bite back by spore-ting this tee that says it all: Blight Bites! Each shirt features the "Blight Bites" image front and center with a very small Hudson Valley Seed Library logo on the sleeve. The American Apparel-brand natural-color shirts are made in America and woven from 100% organic cotton; the printing is done by Antilogy Designs in Tillson, New York. The logo is based on a design created by Michael Wilcock.